Prediction tool to define community acquired pneumonia severity on presentation to hospital, recommended by the British Thoracic Society. Research authors: Lim W, van der Eerden MM, Laing R, Boersma W, Karalus N, Town G, Lewis S, and Macfarlane J. In the assessment of severity in community acquired pneumonia (CAP), the modified British Thoracic Society (mBTS) rule identifies patients with severe pneumonia but not patients who might be suitable for home management. A multicentre study was conducted to derive and validate a practical severity assessment model for stratifying adults hospitalised with CAP into different management groups. Data from three prospective studies of CAP conducted in the UK, New Zealand, and the Netherlands were combined. A derivation cohort comprising 80% of the data was used to develop the model. Prognostic variables were identified using multiple logistic regression with 30 day mortality as the outcome measure. The final model was tested against the validation cohort. 1068 patients were studied (mean age 64 years, 51.5% male, 30 day mortality 9%). Age ⩾65 years (OR 3.5, 95% CI 1.6 to 8.0) and albumin <30 g/dl (OR 4.7, 95% CI 2.5 to 8.7) were independently associated with mortality over and above the mBTS rule (OR 5.2, 95% CI 2.7 to 10). A six point score, one point for each of Confusion, Urea >7 mmol/l, Respiratory rate ⩾30/min, low systolic(<90 mm Hg) or diastolic (⩽60 mm Hg) Blood pressure), age ⩾65 years (CURB-65 score) based on information available at initial hospital assessment, enabled patients to be stratified according to increasing risk of mortality: score 0, 0.7%; score 1, 3.2%; score 2, 3%; score 3, 17%; score 4, 41.5% and score 5, 57%. The validation cohort confirmed a similar pattern. A simple six point score based on confusion, urea, respiratory rate, blood pressure, and age can be used to stratify patients with CAP into different management groups. 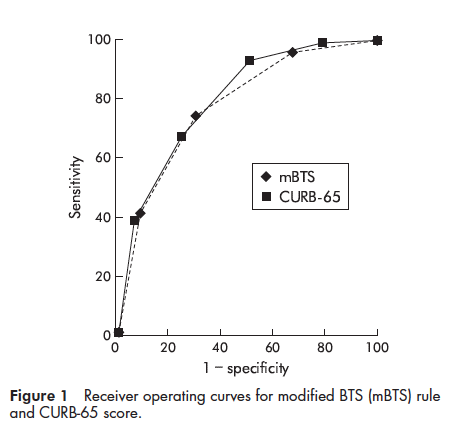 Patients with CURB-65 scores 0 and 1 are at low risk of mortality (<2%) and might be suitable for management as hospital outpatients or by their general practitioner. Patients with a score of 2 are at intermediate risk of mortality (9%) and should be considered for hospital supervised treatment. 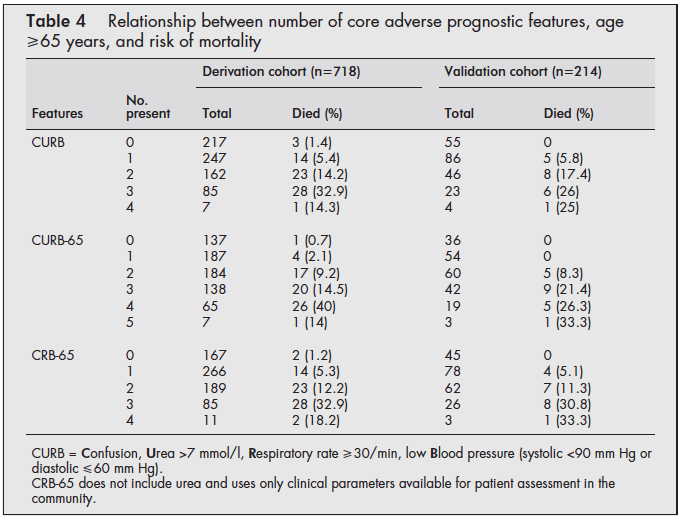 Patients with a score >2 are at high risk of mortality (>19%) and should be treated in hospital. Initial care in an intensive care or high dependency unit may be appropriate in those with the highest scores. 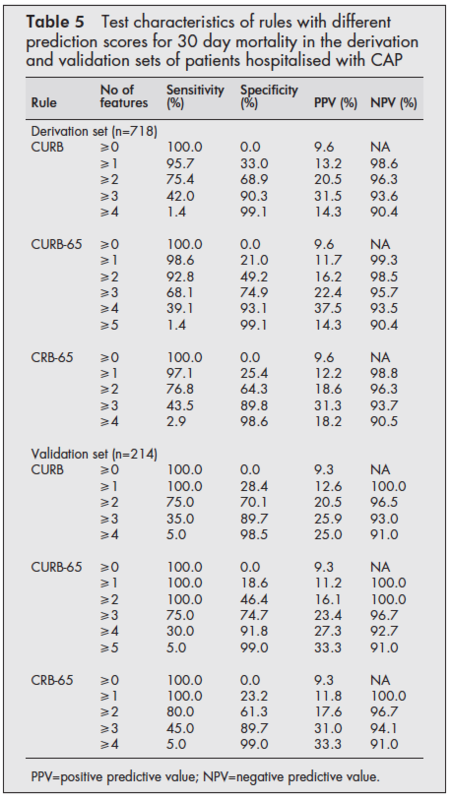 Although low serum albumin was identified as a strong independent prognostic variable in addition to the CURB score for predicting 30 day mortality, it was not included in the final model as it is not a routinely available test in many hospitals. If serum albumin level is at your disposal, you might consider using a more extended model including serum albumin. Lim WS, van der Eerden MM, Laing R, et al. Defining community acquired pneumonia severity on presentation to hospital: an international derivation and validation study. Thorax. 2003;58(5):377-82.